OK!! So my pal Mart & I were chatting about Val Kilmer (I had just watched Tombstone) and Doc "I'm here Huckleberry" Haliday deserved a mention. Kilmer seemed to have the world at his feet sky rocketing career, buckets of talent and the golden touch. What went wrong you may ask yourself? I should mention that these stories are hearsay & never been proven in a court of law. 1. 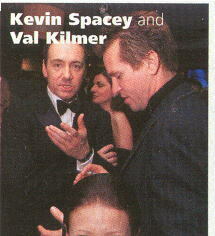 Circa 1980 - Apparently Kilmer & Kevin Spacey were amigos before either made it big. Val is set to go to Juilliard and become an ACKTor. He convinces the penniless Spacey to do the same. So spacey borrows the tuition fees from Kilmer's father. Spacey never repays the loan. This causes a rift between the 2 friends that continues to this day. Side note: Up until 2002 Kilmer was the youngest student ever accepted into Juilliard's Drama department. 2. Circa 1986 - Val is up for a career making role as Kyle Reese the hero in an edgy sci-fi film called the Terminator. For some reason Arnult nixes the idea and squashes Val's chances. Ironically Arnult was the first choice for Kyle Reese, but when Cameron meets him, he decides he is more Terminator material. as Afterschool Special: One Too Many, Spartan, Red Planet, Batman Forever and Alexander." Producer:"PA get me Clooney on the phone & Val Don't slam the door too hard on your way out. 3. Circa 1995 - Kilmer career is bottoming out but gets the chance to act in a contemporary version of "The Island of Dr. Moreau" with Marlon Brando. By now Kilmer is a few roles away from Van Damme/Lundgren/Rourke status. However the producers clearly happy to have Kilmer on board and buckle to his ongoing demands including swapping from the lead hero to the Doctors sidekick. However ongoing clashes between Kilmer & Stanley continue. Eventually Kilmer gets Stanley replaced by Frankenheimer. Putting Stanley’s career on hold again. Ironically by the end of filming Frankenheimer vows never to work with Kilmer again. In a bizarre move Stanley hides out on the island set, gets disguised as one of the "mutated" extras and continues to be part of the film. Seriously who can blame the guy for not letting go of his dream? Yea!! I'm rooting for the guy he's talented and will eventually break Hollywood. 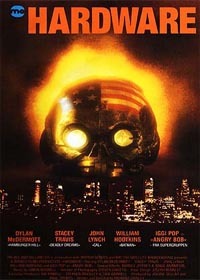 Just watch "Hardware aka M.A.R.K. 13" his first big effort. The screenplay was written by Kevin O'Neill (comic legend). Although a low budget, the film exudes imagination, skill & talent. C'mon Iggy Pop as the DJ voice of Angry Bob. The destined for eventual greatness Dylan McDermott is the protagonist in this tale of a dystopian future. OK so on balance Kilmer's ego seems to be writing cheques his talent can't cash.